Games are fun. Sometime in life you have to do things that are not inherently so fun. Here’s an idea: let’s take an aspect of our lives that we HAVE to do, but aren’t excited about and see if we can make it into a game. I do this with my kids all the time; we turn tasks like gathering dirty clothes, picking up toys, and getting dressed into fun little games that get them excited, motivated, or just playful about these activities as opposed to uncooperative, sullen, or grumpy. Games do that... they engage us, reward us, and generally make things more fun. I was insprired to write about this when I recently came across an explanation of an online game that was designed specifically to make real-world tasks more appealing. 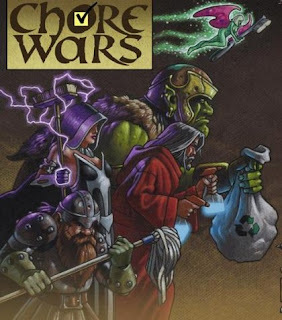 Chore Wars is an interesting-looking multiplayer chore management game. We haven't played it yet, but from what I can tell it's a game world in which you take on specific real life household tasks to gain experience and level up your in-game character. This can be used to make undesirable jobs exciting and motivate yourself (or kids, or whoever) to actually clear out the cobwebs in the corner of the ceiling…literally. You can pretend you are facing off against a giant spider hoard while swinging the broom, and then log the exp afterwards. Or if you are more of the competitive type, you can show up your roommate by gaining more exp and gold than her! Or offer prizes to motivate a spouse to accomplish the items on the honey-do list that have been hanging out for waaaay too long. The idea is to have fun, receive recogntion for the hard work you do, and reward yourself for a job well done. We’re getting ready to launch a Chore Wars account for our household because.. why not? We have to clean up after our whirlwind children (and ourselves! ), so why not add elements of motivation, reward, and fun to the equation? After we try it out we'll let you know what we think... and if Chore Wars sounds fun, give it a try and tell us how it worked (or didn't work) for you! If Chore Wars doesn't get you excited, there are lots of other ways you can incorporate playing a game into your daily routine. It doesn’t have to involve complicated rules or computer programs or bits to be effective. Fun, fun, fun is the main point here. So here’s my challenge to you… come up with (or discover) a game you can play with your family, friends, coworkers, roommates, or by yourself that makes some aspect of your life a little more enjoyable, and post what you did in the comments to inspire others! Let’s get a big group-think on and see if we can’t find small ways (or big ones) to turn those frowns upside down! Ever have a habit? A full-on, I REALLY NEED something. Whatever that something is. Well, I can tell you that my wife and I were there with Magic: The Gathering. Well, more her than me. But we were both pretty stupid about it. I had first came into contact with Magic in the early 90's, shortly after its release. I was hanging out with my friend Al and he whipped out a couple of decks and offered to teach me to play. I was initially a little opposed to it, but we played a few games and had fun. I never got really into it because I always considered it a "rich kid wins" game. Again in the mid-90's, I was a night manager of a coffee shop in Lexington, Kentucky, and a coworker mentioned that since there was a comic shop down the hall from us, we should each grab a starter deck. If each of us only ever bought one booster at a time, and only when the others did the same, we wouldn't need to worry about the whole money pit the game was. It was around that time I really started to see the extent to which it was truly a huge money pit. Being so close to the comic shop, a few kids would see us play on slow evenings and talk about their decks. "My red deck blah blah blah...". Red deck? You mean you make decks of just one color!?! Yeah, I know. Utter noob. I really knew nothing about deck construction. We played that way for a short time before getting bored, before I even got to understand much about the depth of the game. Fast-forward ten or so years. Moreso a gamer than ever. Further, my frequent visits to game shops for other games (boardgames and RPGs) has increased my exposure to M:tG. I still, ven more than before, consider it a "rich kid wins" game. But now I'm married. Katie has been born, and my available time for gaming has decreased. Several friends are pretty into Magic, and Angie is starting to want to play. I am definitely apprehensive about it, and convince her we don't want to go there. For awhile. Then... XBox 360 comes along, and the Duels of the Planeswalkers game releases as a downloadable arcade game. For those of you who don't know, Duels of the Planeswalkers is Magic. And who starts playing that game? If you guessed Angie, you win! For quite a while, Angie raves about it. Eventually, I relent and try it; I kinda like it. And so it began. We started with some pre-made starter decks for the Conflux block. She had JUnd: Appetite for War and I had Bant: On the March. Soon, that wasn't enough. And then we started buying cards out of the penny and nickel bins. Some quarter rares. And then... the boosters. The booster packs are definitely what get you. Opening a booster is like getting a fix. And much like a fix, there are diminishing returns. Now, I'm not going to make light of something serious like drug addiction by continuing too far down that path with the analogies, but there is definitely something addictive. So a booster... for those of you not familiar, a Magic booster has 15 cards: one rare, ten commons, three uncommons, one basic land. After opening the first 5-10 from a given block, you're going to seeing mostly the same commons and uncommons. And it's just going to be the rare that excites you. But you need to get more! Because you want the maximum number of a given rare for deckbuilding. And that can add up. And it did. Short trips to the Magic shop for "just a few quarter rares" often ended in bringing home a handful of boosters. Trips to Target to pick up prescription medications often ended in -you guessed it- a few boosters, as well. They're everywhere. And when you're in it it, you see it. After all, it's just one pack, right? Angie, again, was always particularly bad about this. But I was an enabler. And I did it, too. The last set we purchased was Scars of Mirrodin, and we had already started being more cautious about it. And we still ended up with three Fat Packs ($25 sets with I believe 9 boosters each), a few fistfuls of boosters, as well as what we each got at the pre-release and release days. They don't call it "cardboard crack" for nothing! I'm not sure how much we've spent on Magic over the last two years, but it was quite a bit. I am happy to say that now we have moved on. We shook the addiction. Anyway, now we're looking for a replacement. We've been playing a little Warhammer: Invasion lately. It's not a CCG (collectible card game) like Magic; it's an LCG... a Living Card Game. What does that mean? It means that you don't have to buy boosters, that's what! There's the base game, and then there are monthly releases. The monthly release has twenty new cards with three copies of each; it sort of expands like a board game. So far, I like the format. The jury is still out on the game, though. I'll cover Warhammer: Invasion and Living Card Games in another post, though. In regard to Magic... we still like the game. We certainly have plenty of decks, and loads of cards to make new ones. Heck, I even think we'll continue to purchase their annual multiplayer format releases, as well as duel deck sets that interest us. But beyond that? Nothing. A little too much for us! So... the craze has struck again. My wife and daughter just got.... the new Pokemon games. Yup. Plural. This weekend marks the introduction of Pokemon Black & White into our household. Today, I visited not one, not two, but THREE stores to get all the Pokegear necessary for my girls to feed the Pokebeast. We went to Best Buy and bought Pokemon White for Katie, then Target to get Pokemon Black for Angie and then to Borders to get the Pokemon strategy guide volume one. 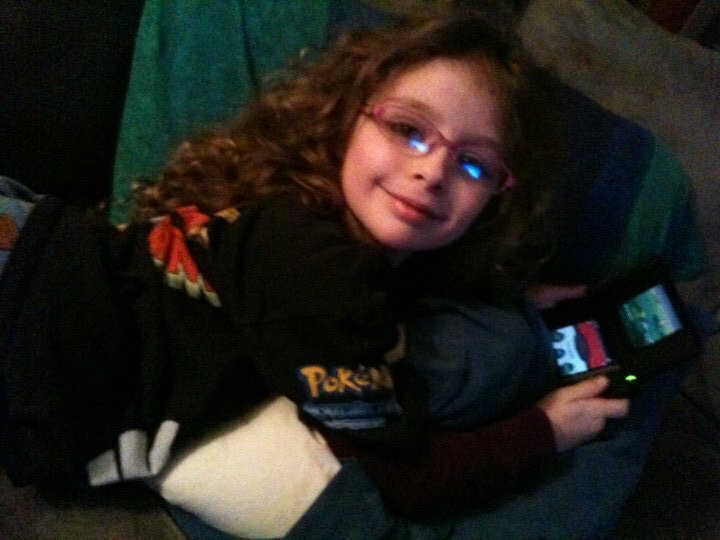 I'm pretty resigned to both my girls each toting around their Nintendo DS for a month﻿, as they did with Heart Gold and Soul Silver last year. Hello, everybody! After I explained my game idea for Princess of the Hill to Katie and showed her some of the concept art I've whipped up she had some ideas for me. Here is what she said to me... enjoy! Katie: "It's a four player game of princess battlers. That's the name! Call it 'Princess Battlers'! They fight with paint scrapers. They're really strong princesses." Randy: "How should the game be played?" Katie: "I'm still thinking about that. Every player has two scrapers. They have to knock all the other princesses off the hill. " Katie: "Yeah... they should have hundreds of pants, hundreds of shirts, hundreds of everything." ﻿Well, that's what Katie has to share. I hope you all enjoyed it as much as I did! The Workshop: Princess of the Hill! I've decided that I'm going to go in a different direction for this post: I'm going to make a game. Now, it won't be finished at the end of the post, of course. But I expect that this will be a series of posts, hopefully culminating in a playable game! The idea is to share the process that I'm using and get feedback. I have not yet completed a game, so here's to hoping this is my first! So, the concept: a hex-based tactical combat/area control game. The idea is to bank as many points as you can, doing this by maintaining control of the central hex on the board. Other players (at least one more, probably more) are trying to do the same. You will play cards to do everything in the game, I'm thinking. The game play will be focused on getting your token on the space and staying there, and moving others' pieces around the board (or at least off the space). I even have a theme: Princess of the Hill! 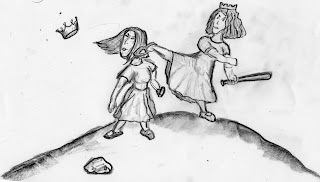 A knock-down, drag-out brawl between the kingdom's elite offspring. I'll mock up some more pictures soon... that helps me get into the mindset more. I haven't decided whether they're going to be kids or adults. I feel good about the theme and believe a fun theme is going to help get the creative juices flowing. Hexes. My idea was a central hex with three or four concentric rings. I think this would be a good representation of our hill. Player tokens will be hexes, as well. As a matter of fact, I think that facing will be relevant, so front vs. back will have a game effect. The idea is that the player controlling the central hex will be in a more precarious place. Combat. Combat should be simple and fun. Perhaps a rock-paper-scissors style resolution, similar to Yomi. My moves will be Push, Drag or Strike. So, Push beats Strike beats Drag beats Push. We'll get back to resolving same vs. same later... or maybe it just means discarding and choosing again. We'll see. Additionally, there will be special moves. I'm thinking Feint, Suckerpunch, Charge. Maybe also values for attack types. I'm thinking successful Push or Drags will move the defender farther or closer to the Attacker, respectively, and Strike will do damage to hand cards, as in discarding as "damage", but without player elimination. Since the combat is the central part of this game, we're going need to make this tight and refined. Movement is a necessity, too. I'm considering paying for movement, or perhaps for movement beyond the standard allotment. Payment would be in hand cards (not special movement cards or something), if that gets figured in. I like the idea of being able to rush, but that this would result in you being a little weakened from the effort. With this added, and damage being applied to hand cards, this makes the ebb and flow of the hand size directly correlate to energy of the character. Speaking of hand size, players need to get cards. My thought on this is that while on the top, you draw one per turn. Each successive ring adds one to your draw value. Without cards, it's tougher to fight and hold onto the prize. Also adds the consideration of stepping down to "rest" and regain a hand. Scoring... we need a way to win. My thought is that if you end your turn on the middle hex, you can bank one hand card as a victory point. On the middle hex, you're only drawing one per round so you won't be holding it too long, assuming other players are attacking. The full idea is this: I want to make a game with a fun theme (check!). I want it to be tactical, with somewhat of a resource-management element. I also what it, despite its theme, to be playable as a serious area-control game with serious tactical considerations. I'm of the opinion that my idea here is workable, and that I can bang this into working game. That being said, anyone have any advice to offer? I'm hoping to make this a work-in-progress type thing and spread it over several blog posts. I'll continue to work on this and share my ideas. That way, we can all learn about game design together! As a parent of young children, it is often tough to find time to game. Or energy. Gone are the carefree days of playing game after game after game. There's always something coming up... late bedtimes, going to the store for medicine, washing diapers (for cloth-diapering hippies like us! ), cooking, cleaning random messes the kids leave... yeah, free time is at a premium. Every minute counts. So I have to shoot for getting the most out of my time when gaming. So what does that mean? How do I get the most out of my time gaming? Honestly, I'm still working it out. I have 5 years of practice, though, and I'll share what I've figured out. Here are some guidelines I use for finding the "sweet spot" in gaming. 1. Avoid games with complex or fiddly rules. Some games are just elegant. Play progresses in an orderly fashion, there's an FAQ in the rulebook covering anything you need, and people just "get it" after a quick explanation. Play these games. And avoid games (especially teaching games!) that require a trip to boardgamegeek.com to arbitrate a rules question, use arcane iconography or just make things complex. A game that I really like that fits into this category is Race for the Galaxy . I love the game. I really do. The iconography makes it hard to teach, though, so it's not going to hit the table when new players are around. Especially with expansions. Complexity doesn't need to be there for depth, necessarily. So when a game delivers a comparable experience without the fiddliness, go for that one. 2. If the kids are around, figure in additional time... or get a babysitter. I don't know how many games I've lost due to having to parent. In the scheme of things, it doesn't really matter. A game is a game. But gaming is a hobby, and meant to be relaxing. Socializing. Interacting with friends, or maybe just unwinding with the wife. And it really gets frustrating when I feel that I can't remember what I'm doing from one minute to the next due to constant interruptions. I'm not the best multitasker (just ask my wife! ), and the kids usually get the priority in any situation where they're involved. A good thing to do is to make sure you "load 'em up" with attention beforehand. If they're going to be supervised less during play, set their expectations and try to meet all their needs (immediate and anticipated) before you sit down. Gaming with other parents helps. Often, kids will play together. Another option is a babysitter. Even having a babysitter over at the same time is a great thing, and well worth the investment. 3. Maximize the "Fun vs. Time Spent" ratio. Some games are just long. I'm not adverse to playing a long game; I enjoy the opportunity every now and then. But some games... are just long. As an example, I don't really feel that I get more out of Axis & Allies than I do out of Memoir '44 . I'll definitely be playing it for five more hours, but I don't necessarily think that Axis is going to deliver six times the fun just because it takes six times the time to play. That means that it has a poor fun:time spent ratio. Look for games that deliver the essential experience. Some games are going to tale longer to do that, so make sure that when you're selecting a game to pull off the shelf, that there isn't a game that delivers the same experience in a shorter time. 4. Read reviews of games before you get them. So what is "the sweet spot"? The sweet spot is primarily about being cognizant of factors like time and parenting when purchasing games, choosing which games to play and playing games. How this is defined for each individual is definitely going to vary. Just think of this as a game itself! It's a very complex resource management game, and the resources are time, money and attention. Stay aware of this, and you'll find your sweet spot! We played a new game, Castaway's of Deadman's Bay . It’s a battlers game about pushing people off the plank, striking them, or insulting their crew. The battlers are pirate captains! It’s awesome, AWE-some! Mom and I play “Kate” and daddy plays the one named “Jack”. Because the characters are named Kate and Jack like me and my brother that just makes the game so special! How You Play: You play a card and try to trick your dad by playing a card and mindreading like I do. You pick a card and if it’s the right one KABOOM, BAM, and then BABABOOM to win! Power ups are the cards you can play to make your moves better so they do more damage. What is easy: This game is easy, really easy. The reading parts are OK because I can show my mom since we’re on a team. My mom read me the cards and since I heard them a bunch of times I know what they say. I can tell them apart by the colors. The cards that, like, power up a move match the color of the move and that makes it easy to tell what they are. What I like best: My favorite part is that we are so good at pushing him off! I like that we got to knock him straight off the plank! We won by figuring out what daddy was going to do… he thought we were going to charge because we had the most charge power-ups but I knew he was going to think that so I just threw down an insult and that won the game! I love the thinky parts of the game where you try to guess what they are going to try to do! What I like least: That Jack is too little to play, but I anyway had fun with it. How much I like it: I like it two-hundred and forty-four. 2-4-4. That means I really like it and it’s one of my top favorites. I want to play it again and again! "I really liked the fact that the emphasis on this game was on thinking through what your opponent might do and trying to outguess them. The game was simple, but provided a good skill building opportunity for the younger gamers in your family while still remaining interesting enough for parents to have fun playing. Plus, it’s pirates! This is the first game of this type we’ve played with Katie in which I think she really got that element of trying to read your opponent and use deductive reasoning to figure out the best move. It’s a great gateway into a whole range of strategy games in which it is important to try to predict what your opponent is going to do… Race For The Galaxy, Yomi, and Agricola to name a few. It’s definitely a game I can see playing “again and again” with our little pirate captains." "Let me start by saying a big hearty "Thank you!" to Ian Volkwein, the designer of this game, for providing a review copy of this game. We really enjoyed this game, and Katie is excited to play it more. I like the bluffing mechanic. This game is a great introduction to games that include anticipating your opponents moves, and those that use "Rock-Paper-Scissors" mechanics. In this one, you want to match your opponent when defending and choose differently when attacking. The powerups and action cards keep it fun and exciting. I definitely recommend this for younger gamers. There is card text, so it's best for those kids who also read. You can read more about this one at Ponderzombie Games. Yarrr!" I didn’t want my mom and dad to say anything on this blog post because it’s MY blog post and they can just write their own, but they really wanted to so I just let them do it. Then what they wrote was cool, so I’m kinda OK with it now. I just didn’t want you readers to think their words were my words. That’s all. Thanks for reading my blog!